Burger King is like Ashley Madison for meat patties. In New Zealand, the fast-food chain is encouraging consumers to "cheat on beef" with its new chicken burgers as part of a #MotelBK campaign. 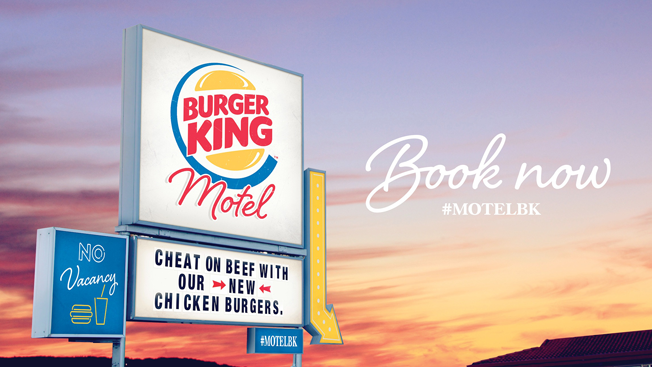 BK has taken over an actual motel in Auckland, outfitted the rooms with BK booths and is inviting people to book them and try the chicken burgers (and of course, share photos of their experience socially). Still, BK's New Zealand agency, Colenso BBDO, is on a roll, serving up this work—salty, satisfying, not too nutritious—in the wake of its self-hating pre-roll ads and the crazy spot with the Russian bride. Even if it is hard for any BK ad to use a grainy cam without smelling ever so slightly like the classic Whopper Freakout.